Do you have a vegetarian coming over for dinner? No problem! Make this veggie chili and everyone, including the carnivores, will love it! It’s healthy and delicious. A few days before Christmas I made a pot of this chili for my family and friends side-by side with the incredible turkey chili I posted a couple of weeks ago. 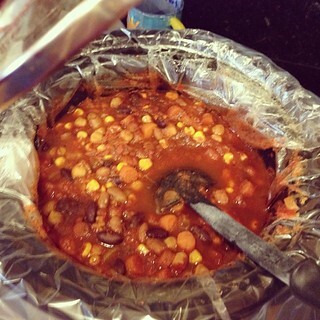 That night I actually ate a bowl of the vegetarian chili for dinner and I really enjoyed it. The seasonings are almost the same as the turkey variety except the meat is replaced with carrots, bell pepper, and chickpeas. You can probably add other vegetables too (zucchini, celery, but I wasn’t sure which ones would work best so I erred on the safe side. Potatoes or butternut squash or some kind of grain (like quinoa or lentils) would be good too. So pretty much customize it however you’d like! Next time I’ll make chili I’ll give some of those options a try. Just like the turkey chili, I wrote the instructions for making this chili in a slow cooker since that’s what I would have done if I was in my own kitchen, but simmering it on the stove top for several hours works too. Just leave the lid on, propped open to let steam escape. Delicious! Heat the olive oil over medium-high heat in a large skillet or pot (nonstick or otherwise, doesn’t really matter). Add the carrots, bell pepper, and onion, stir to coat, and saute until the veggies start to soften, about 8-10 minutes. Add the chili powder, cumin, garlic powder, paprika, oregano,salt, pepper, and cayenne pepper (if desired). Stir until the spices are well incorporated and cook until fragrant, about 2 minutes. Remove from heat and add the veggie mixture to the bottom of your Crockpot (I recommend using a liner to make clean up a breeze). Pour the diced tomatoes, tomato sauce, and drained and rinsed beans and chickpeas on top of the veggie mixture and stir gently to combine. Put the lid on the Crockpot and cook on low for about 8 hours or high for 4-5 hours. Enjoy! Based on Home Cooking Memories’s Veggie Chili.